Japanese KIGO for Festivals and Ceremonies are introduced here. They are from Buddhist, Shinto and other backgrounds. 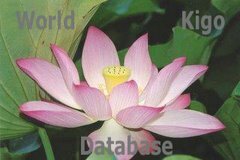 This is an educational site for reference purposes of haiku poets worldwide. the Seven Gods of Good Luck ! It may seem comical to the outsider, but for residents of Hofu, Yamaguchi 防府市大道小俣地区Prefecture, the waraiko is a serious affair. On the first Sunday of December, the chief priest of a local Shinto shrine 小俣神社 leads 21 parishioners in an ancient ceremony to offer one's heartiest laughter to the gods. This is a ceremony to bring the old year to an end. This is one of the special exceptional ceremonies of Japan. Since Showa 44 it has become an intangible cultural property of the town. This ceremony is more than 800 years old (since 正治（しょうじ）元年(１１９９)) and lasts from 11 in the morning till 3 in the afternoon at the home of the Elder for this Ceremony, who is changing every year. They welcome the God of the Year (ootoshigami 大歳神) to his home to entertain him with their laugh. 21 men, one of each household, take part in it. They give thanks for the harvest of this year and pray for a good one in the next. Each then receives a big bowl or some bamboo twigs and lifts it to his head, laughing loud three times: Wahahaha ! first to thank for the harvest of this year, Wahahaha ! second to pray for a good harvest next year and Wahahaha ! a third time to forget the bad things and the sad things of the last year. Then they drink sacred ricewine (miki) whilst sitting facing each other, lifting the cup and laughing three times for each toast. If the Elder of the Group finds the laugh was not from the heart and true or did not express enough funny dignity, he would bang on a metal washbowl and they have to repeat it. The Laughing Group, Warai-Koo 「笑い講」is a serious matter, after all ! I watched on TV this year and we ended up laughing our way right toward heaven too! A rather funny serious ceremony. I will try and find more about its origin.
. Year End Singers . sekizoro　節季候 . Written in 寛文7年, Basho age 24.
these blossoms . . .
To say that flowers or cherry blossoms burst out into laughter　in spring was a kind of cliche even at the time of Basho. at the end of line 3.
should I laugh? should I cry? Here Basho also thinks about his own face as it changes when getting older. This is a pun with the flower "asagao", "morning face" in Japanese.
. Face faces (kao　顔) .
. - asagao 朝顔 morning glory - .
. Matsuo Basho 松尾芭蕉 - Archives of the WKD . They pass the painting to get into the laughing mood for the real ceremony ! 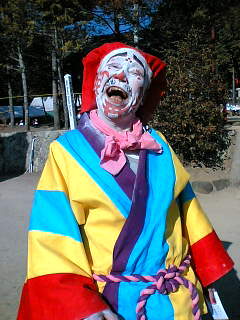 Chiba warai 千葉笑 (ちばわらい) "laughing in Chiba"
At the temple Chibadera 千葉寺 in the town of Chiba. On the last day of the year, people assemble and have to hide their laughing faces until all at once break out in a huge laughter 嘲笑 (ちょうしょう chooshoo). 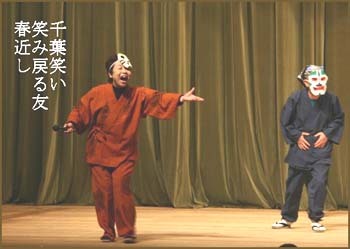 It is also the theme of a Kyogen play 千葉笑い. A poisonous mushroom that makes people laugh if they eat it. This hokku is from Issa's diary for New Year's for 1823. It refers to Issa's infant son Konzaburo, who was born in April 1822. He greets the new year in the arms of his mother Kiku and smiles widely and auspiciously, giving Issa the impression it will be a good year for the family. Unfortunately Kiku died in June 1823 at age thirty-seven, and Konzaburo died a little less than a year later, in January 1824. .. .. .. Read the latest KIGO additions HERE !
. . . THE TOP of this SAIJIKI . . . THANK YOU and COME BACK SOON ! All translations, unless stated otherwise, by Gabi Greve.